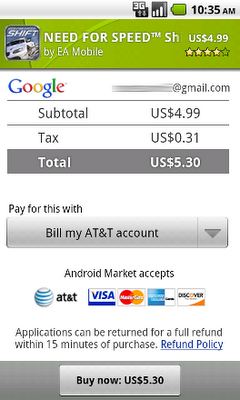 We strongly believe carrier billing is a great way to make it easy for users to purchase and pay for applications. In addition to the availability of AT&T and T-Mobile US carrier billing, we’ll continue to to partner with more carriers to offer carrier billing options for their subscribers. But wait, will Verizon users ever see this option? Verizon already has its own app store with statement billing which would make a partnership with the Android Market seem contradictory. And my excitement is gone again.